Family meals help parents teach children healthy eating habits for a lifetime. Family meals are all about eating. Right? Well, that’s kind of true, but family meals also can be about learning to eat right, as well as learning many other things. Family meals offer “teachable moments” to explore different foods. Family health is important. Families who regularly eat together tend to have healthier eating habits and better health. Whether you’re sharing a meal at a park, in a car or at the family table, children who eat with their families eat a more nutritious diet. For example, they eat more fruits and vegetables, more calcium-rich foods and less soda pop and snack foods. Family meals provide a meaningful opportunity for parents to model healthy eating practices. Parents can model eating a variety of foods by enjoying three or four different foods at a meal – and they can encourage their children to do the same! • Eat moderate portion sizes. Try using slightly smaller plates or serving bowls to encourage moderation. • Eat at a regular time and place during the day. 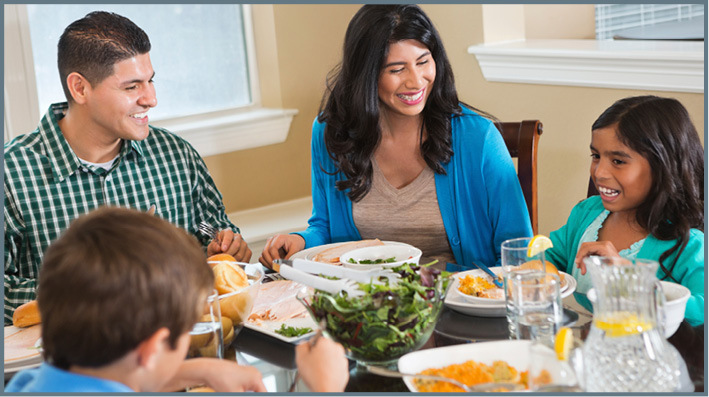 Family mealtimes help provide a structured time for eating rather than snacking at all hours. Random snacking can lead to overeating. • Get enough to drink – especially water. Choose healthy beverages, such as water, low-fat milk and 100 percent fruit juice. Minimize sweetened beverages or soft drinks. • Offer fruits, vegetables and whole grains instead of high-fat snack foods. Although a few potato chips are OK to eat occasionally, these foods should not be consumed often. • Discuss healthy nutrition and good food choices during the family meal. Talk about – and model – the kind of eating patterns you would like to encourage as a family. • Pay attention to the foods you make available. Provide a variety of nutritious food choices and encourage children to try them (but do not force them). Question: I can’t seem to get my kids to eat their vegetables, but I know they need them. I’m so frustrated. What can I do? Getting children to eat vegetables is a common challenge for many parents. Continue to offer small portions of vegetables at each meal, even if a child often has rejected the food. Kids often avoid new or different foods. Sometimes you’ll need to make 10 to 15 attempts before a child will taste an item. • Try incorporating veggies into recipes such as pasta sauces, casseroles and soups. • Serve veggies raw or cooked until “just done” – not mushy. • Involve children by growing a vegetable garden or a container garden on your deck or front step. • Have children help choose recipes and help pick out vegetables at the store. Try a different vegetable or a different form of vegetable every week or two. • Cut raw vegetables into fun shapes and serve with low-fat dressing or dip. Question: Is enforcing the “clean plate club” rule OK? Be sure to offer a wide variety of healthy meals and snacks, but let children decide what and how much to eat. This lets children learn to recognize when they are hungry or full. In the long run, this will help them eat what their bodies need and may help promote a healthy body weight. Wash potatoes, but don’t peel. Slice into ½-inch thick strips. Blot dry with paper towels; toss potatoes with oil in a bowl until coated. Sprinkle with seasonings if desired. Spread on baking sheet and bake at 450 F for 20 to 25 minutes. Toss with Parmesan cheese (optional). Each serving has 100 calories, 2.5 grams (g) fat, 2 g protein, 18 g carbohydrate, 2 g fiber and 10 milligrams sodium. Quick Tip: Keep peeled, sliced potatoes from browning by placing them in water.